It's kind of a truth that if you coat anything in breadcrumbs so it's crispy all over, people—even kids—are going to want to eat it. This recipe for oven-baked asparagus is no exception. It's a healthy snack disguised as crispy, delicious "fries." Japanese panko along with Parmesan cheese make the coating even tastier. Try serving these at your next party as finger food. The best part is the asparagus are baked, not fried, so you don't have to use a ton of oil and your house won't smell like a fast food joint. Don't toss those asparagus trimmings! Freeze them in a resealable plastic bag and you can use them to make asparagus soup later. Per Serving: 167 calories; 5g fat; 21.8g carbohydrates; 9g protein; 69mg cholesterol; 414mg sodium. These were really good, I love the crunchy parmesan and panko bread crumb coating. It makes the perfect crisp on the outside, and the asparagus isn't soggy either. I loved these asparagus fries, they were so good. It reminded me of vegetable tempura, but with a different batter. They're so addicting, you'll want to eat a whole lot. 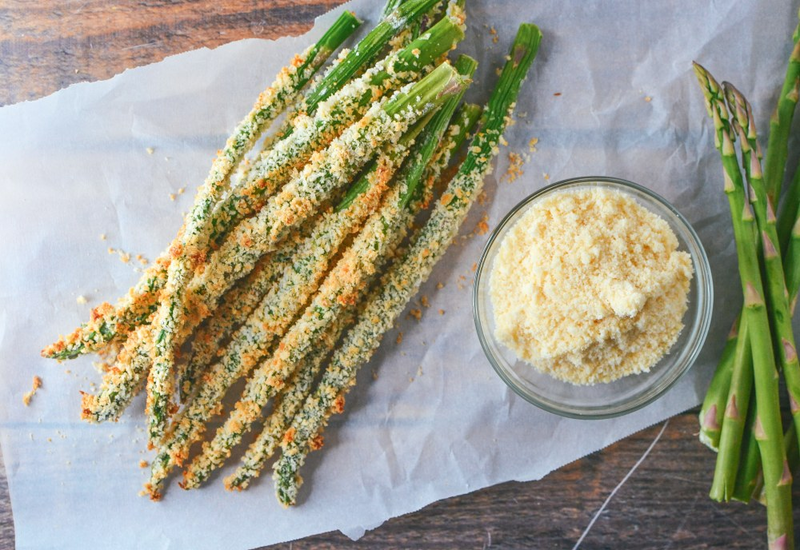 These crispy asparagus fries remind me of fried zucchini but much, much healthier. I'm staying away from fried foods, so I definitely enjoyed making this. If you like asparagus, you have to try this recipe.